Are you a chronic complainer? What is with people and complaining? Seriously, what does complaining do for people that they insist on doing it? Does it provide some type of euphoria? Why is it sooo extremely difficult for people to just be happy? No matter what the circumstance is people just never seem to be happy. I was watching The Bible over the weekend, and they came to the scene from the book of Exodus when Moses had assisted in setting his people free from the hands of pharaoh. In the scene, the people were at the red sea and they were all complaining, yelling, and so upset with Moses. They were complaining about the location he had brought them to, complaining about food, complaining about everything. I thought to myself, really people this man (with the help of God) just rescued you from slavery and a life of poverty and torture and yet all you can do is complain. Then it dawned on me this is true for many people. You can give some people the moon with a red bow and they will say, I asked for the sun or why is the bow red. You have those women that complain about their husband, their children, their job. Those men that complain about their wife, their job, their life. I decided to dig a little deeper into understanding complaining, and what I learned is that complaining does in fact provide people with something, it’s called connection! What every human being wants is connection to feel connected to other people. Because complaining is a universal language, what better way to connect to others than through complaining and sharing in unhappiness. I have been to several play groups and the moms will sit together and somehow it turns into a big complaint fest almost to the point of competition on whose complaint is bigger and worse. It amazes me that you if don’t participate in this complaining fest you are isolated, and sometimes even frowned on. Even though connecting to other people is essential for human survival, and complaining can be a healthy outlet, there is a such thing as too much complaining and becoming a chronic complainer. My question today is, are you a chronic complainer? Well, Tanyell, I don’t think I am. I mean I don’t really complain, I just state the facts. It’s not complaining when you aren’t happy about something. I wouldn’t necessarily say I complain, I just say when I don’t like something. These statements are fair, valid, and may prove that you are an expressive complainer, however they may also be cover ups for a chronic complainer. So let us explore the chronic complainer. When a person is around a chronic complainer they leave feeling depressed, drained, sad, annoyed, and feeling like the conversation was pointless and time-consuming. They feel as though the relationship may be one-sided and unsure on what they are getting from the relationship. As a chronic complainer, the person tends to complain to just about anyone about anything. When the person offers advice or solutions, the chronic complainer typically does not adhere to them. They complain without purpose. In their complaining they are usually the victim and it is everyone else around them that is the problem. A chronic complainer will typically dominate the conversations with others. If you find this to be you or find yourself surrounded by a Chronic complainer, have no fear there is treatment. The next time you find yourself getting ready to launch out some complaints, ask yourself three questions. Why is this complaint important, who am I complaining to, and what do I hope to accomplish by launching this complaint. By asking yourself these questions, it allows you time to really marinate on if the proposed complaint is in fact a valid and expressive complaint or if you are on your way into chronic complaining mode. I don’t get it Tanyell, this isn’t making sense to me. Ok, let me give you an example. You have a complaint about your friends children never cleaning up after themselves when they come over to play. You’re friend just left and you are getting ready to launch this complaint to your loving husband. The first question you ask yourself, why is this complaint important? (Because you are tired of your friends kids leaving a huge mess for you and your poor child to clean up after they leave, adding one more thing to your already long to do list. You feel as though it is inconsiderate). Ok, that is valid. Next, Who are you launching this complaint to? (My husband). Ok, valid. What are you hoping to accomplish from launching this complaint? (I need validation in knowing that I am not wrong for feeling this way, and I need a way to approach her and address this issue). Valid. This complaint passes and may be launched. The second part to treating chronic complaining is when you approach the person who is receiving the complaint let them know before launching what you need from them. “Honey I need to talk to you about something. I need to make sure I am not crazy in feeling this way, and if I am not crazy some suggestions on the best way to handle it.” By doing this you are allowing the other person a clear understanding of their purpose, therefore, they do not feel drained after the conversation. By taking these very easy steps prior to launching a complaint, you can easily deter yourself from becoming a chronic complainer. Although complaining can provide some relief and it can be healthy, there are times to see the cup half full and not complain. Many times complaining doesn’t serve a purpose at all. Going back to the story of Moses and Exodus, did they really have reason to complain? What was there complaining going to achieve? In reality their complaining was pure proof of ungratefulness and the inability to be satisfied. Complaining can sometimes say, yea sure I have somethings but these things aren’t good enough. What is for me isn’t good enough for me. When you really look at your life, should you be complaining? This doesn’t mean you shouldn’t strive to be better or do greater things, it simply means instead of complaining be like Nike and Just do it. There is no need in complaining about the cup being half empty. 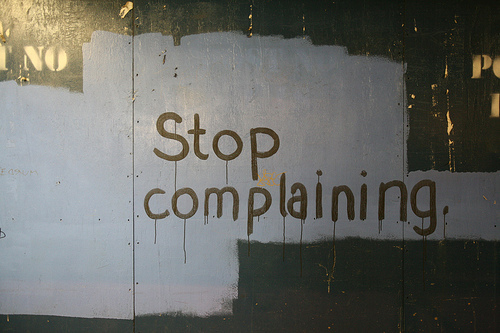 Complaining isn’t going to fill the cup up. What will fill the cup is direct action from you. Complaining simply slows this action down. Imagine what would happen if you went one full day without complaining, and instead made improvements or actions toward improving the things you were unhappy about. Imagine the joy you would feel, the relief, the freedom from worry. How much easier would life be if you simply went to the friend and expressed your dislike of her behavior and rather than complaining about it. Although complaining can be an outlet, it often times leaves us feeling worse, drained, confused, upset, madder, and array of other unwarranted feelings. The bad far outweighs the good when it comes to complaining. Typically people who complain less and see the glass half full are happier, less stressed, and many times successful. Why focus on the negative, if you don’t like something change it and if you can’t change it, there is no sense in complaining about it. The time and energy you spend complaining on things you could be using changing things. The next time you find yourself at a complaining party, really take a moment and ask yourself am I getting pleasure out of this, are these people happy, is this how I want to spend my time, what am I getting from this, and what could I be doing right now instead of this? Then focus in on the people at the complaining party and decide if you want to be like any of these people. Do any of these people hold traits, qualities, or even the kind of life you would like to see for yourself? If you find the answer to these questions is no, it may be time to find yourself a new party to attend. Great post Tanyell. The power of the mind is really amazing what it can do for us in terms of happiness. Have you read some Tony Robbins by any chance? Take Care! I haven’t, but since you have mentioned it I will look into some of his things! I am always looking for inspiring reads and gaining more knowledge! I take it his writings are worth reading? Thanks for reading! Haha awesome! I’d recommend “Awaken the giant within”, it’s is a great read! Definitely worth reading.